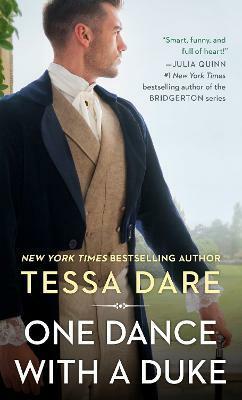 In One Dance with a Duke--the first novel in Tessa Dare's delightful new trilogy--secrets and scandals tempt the irresistible rogues of the Stud Club to gamble everything for love. A handsome and reclusive horse breeder, Spencer Dumarque, the fourth Duke of Morland, is a member of the exclusive Stud Club, an organization so select it has only ten members--yet membership is attainable to anyone with luck. And Spencer has plenty of it, along with an obsession with a prize horse, a dark secret, and, now, a reputation as the dashing "Duke of Midnight." Each evening he selects one lady for a breathtaking midnight waltz. But none of the women catch his interest, and nobody ever bests the duke--until Lady Amelia d'Orsay tries her luck. In a moment of desperation, the unconventional beauty claims the duke's dance and unwittingly steals his heart. When Amelia demands that Spencer forgive her scapegrace brother's debts, she never imagines that her game of wits and words will lead to breathless passion and a steamy proposal. Still, Spencer is a man of mystery, perhaps connected to the shocking murder of the Stud Club's founder. Will Amelia lose her heart in this reckless wager or win everlasting love?